Sixth-grade students in the culinary arts class at Gregory-Lincoln Education Center got a taste of what it’s like to work for the Department of Health and Human Services recently, when they spent an afternoon conducting a mock inspection of HISD’s Food Services Support Facility. Students also learned the importance of good hygiene, such as the importance of wearing hair nets, washing their hands, removing jewelry, and wearing slip-resistant shoes when working in a kitchen environment. 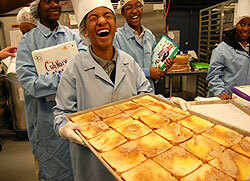 While in the facility’s catering kitchen, students had the opportunity to prepare a new recipe for cinnamon toast (pictured) that is currently being served on the district’s breakfast menu.